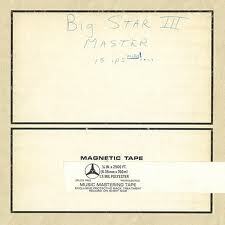 Big star’s third is a ragged, deranged masterpiece that everyone of you should love and know note for note. it’s still debatable whether it is the last big star output or the first alex chilton lp. Even its exact title is uncertain: beale st? third? sister lovers? the fact is that the sessions were erratic at their best and jody stephen’s effort in the recordings is minimal at last. producer jim dickinson (rolling stones, bob Dylan, Flamin’ groovies, mudhoney, ry cooder among others) was a master in creating a chaotic but creative atmosphere even when working on a layered, multitracked song. alex chilton, disenchanted for the commercial flop of both Number 1 Record and Radio City, stressed by the implosion of stax recors (distributor for ardent records, the label that signed big star back in 1971), fueled by alcohol and drugs, entangled in a stormy relationship with the enigmatic, very young memphis scenester lesa aldredge, delivered a bunch of masterful songs of love and despair, laced in feedback noise as well as in lush orchestrations. The sessions burdened by chilton’s temperemental ups and downs were stopped by ardent mogul john fry. a tentative master version was mixed by larry nix on 13th february 1974. All the efforts to market it failed: mayors execs literally refused to touch it, until pvc in 1978 and then aura records acquired the tapes. too late to save the big star as a band… during the 80’s indie darlings supergroup This mortal coil covered “holocaust” and “Kang roo”, the latter covered in the 90’s by the late jeff buckley. Since then Third has exited the cult status and has reached that of undebatable masterpiece it deserves. it has been reprinted several times, the ryko disc cd encompasses almost all the songs recorded in 1974. A couple of years ago, omnivore records released for the record store day a test pressing edition on transparent vinyl in a lavish box with a precisely annotated booklet (don’t try: it’s sold out…). A rare photo by Bill Eggleton of Chilton’s muse Lesa Aldredge. The other girl should have been Holliday Aldredge, Lesa’s sister who dated the Big Star drummer Jody Stephens at the time, hence the working title “Sister Lovers” for the record. Another rare shot of Lesa, taken at Friday’s, the bar where the pics for the cover of Radio City were taken. Alex Chilton, Steve Cropper (who played guitar on the cover of Velvet’s “Femme Fatale” on the record), Jim dickinson, chris bell, andy hummel are all long gone. But the fragile, aching beauty of third is still intact. And the world still need it. So a vast and ever changing group of musician decided to tour the big star masterpiece around the world. It has included among them: michael stipe and mike mills (r.e.m. ), jeff tweedy (wilco), chris stamey and peter holsapple (db’s), ken stringfellow (posies, r.e.m. and big star touring bands), mitch easter (let’s active), robyn hitchcock, sharon van etten and the great jody stephens himself. Here some highlights. 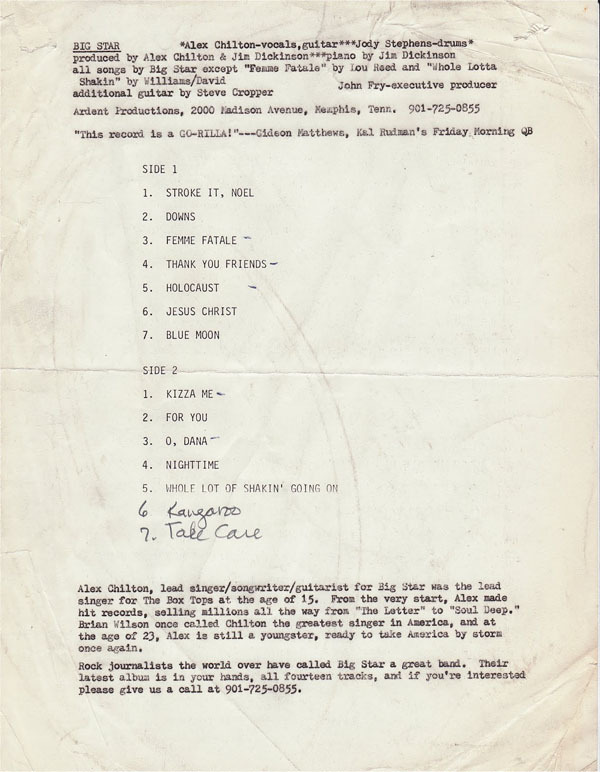 Questo articolo è stato pubblicato in Alex Chilton, Big Star e contrassegnato come Alex Chilton, Big Star, Power Pop da lanini66 . Aggiungi il permalink ai segnalibri. Steve Cropper is still alive!